“New year, new me” means something a little different for everyone! Whether our goal is to become healthier, cook more at home or simply read more, there are so many ways to give our bodies, minds and wallets a bit of a glow up in 2019. Of course, one of our favorite ways to ring in a new year is to reassess our style and thoroughly revamp our closets! We’ve all fallen victim to the budget-friendly lure of fast fashion and this year, we’re aiming to make a conscious effort to incorporate more items that aren’t just beautiful and functional, but also do their part in contributing a positive social impact on the world. One such brand is Nisolo — a shoe and accessory brand dedicated to helping push fashion in a more sustainable direction. Each item is intentionally designed, ethically made, and fairly priced (though more on all three later). Each item is also made to not be something we wear for just one season and toss. Not only are Nisolo products made to last, but they also transcend trends. Case in point: These stunning Nisolo Chelsea Boots! See it: Check out the Women’s Chelsea Boots at Nisolo for $228! Seem like an investment? The boots are eligible for Affirm and three interest-free payments of $76 a month. Also be sure to check out other boots at Nisolo. The boots have a soft leather insole that’ll keep our feet toasty and comfortable, as well as leather lining. One note: They have a slightly pointed toe, which can create a narrow fit. Unless these will exclusively be worn in warm weather and with thin socks, size up! That way, we can comfortably fit a pair of thicker socks. Don’t worry, the leather will eventually break in and form around the foot, so we don’t have to worry about blisters down the road. The boot comes in four different color options! There’s an all-black that wouldn’t look out of place in the chicest neighborhoods in New York or London, as well as a classic black with a brown sole for a more casual vibe. Have enough black boots already? There’s a sand shade that will look adorable at music festivals (think of pairing them with a sundress at Coachella!) as well as a burnished brown shade (aptly named brandy) that’s basically made to be a sidekick for all our medium-wash denim. Reviewers dig the boots too! Many insist that they’re stylish, comfortable and beautifully made. Some note they need to be broken in to get to their fullest potential as an everyday shoe, which only goes to show how high-quality the leather on these booties is. They also garner plenty of compliments (which we totally get, naturally). The best part about them, however, isn’t just the casually cool vibe the Chelsea boots give off — it’s how they’re made. 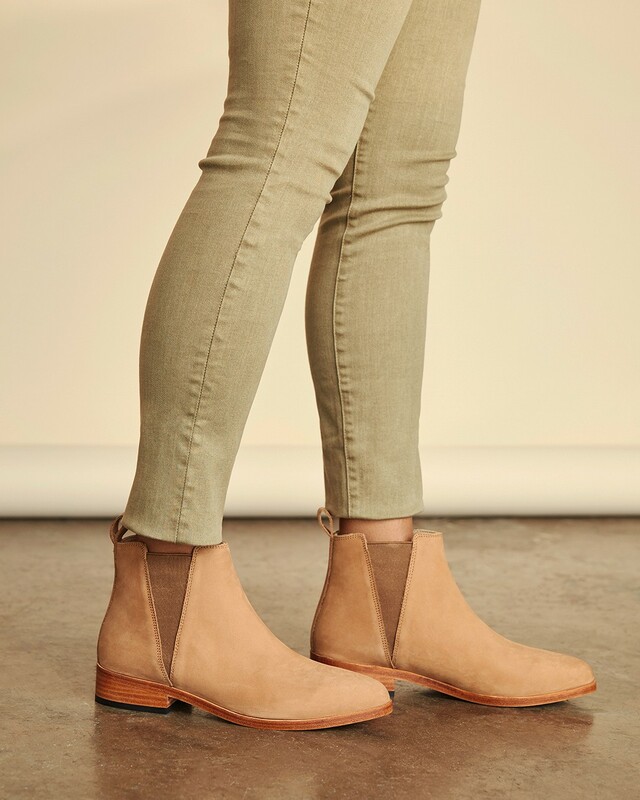 The booties, like all Nisolo styles, are made in an ethical factory Nisolo founded in Peru. All producers receive beyond fair trade wages, as well as healthcare and a healthy working environment. The supply chain is compiled of over 500 people and each purchase helps enable opportunities. The main factory — where nearly 90 percent of production takes place — is located in Trujillo, Peru, and houses 88 producers. The factory is a pioneer in ethical production practices, where the average salary of producers is 27 percent higher than requirements, plus women in particular have seen 173 percent annual income increase in comparison to previous employment. It’s this commitment to sustainability and a positive social impact that makes Us so excited to share our favorite Nisolo finds!